Imagine a country where your mobile phone is taken from you at the airport with no explanation or apology, where there's no access to the internet, where your minders watch every move and you're reported if you try to leave your hotel alone. A country which has not been at war for half a century but has one of the largest standing armies in the world and where people are expected to worship a president who died 16 years ago. No, I am not describing Big Brother and the country of Airstrip One in George Orwell's 1984 - it's the Democratic People's Republic of Korea in 2010. I went to the Soviet Union in the Brezhnev years and have filmed in Burma and Tibet, but I have never before been anywhere I have been so watched and controlled, or where everything is so stage-managed. Potemkin villages sprang up wherever I went. I visited model farms, model villages, model factories and model schools, though, at the school, even my government minders looked faintly embarrassed when I asked a model pupil in an English language class who he admired most among modern world leaders and he answered: "Joseph Stalin and Mao Zedong." 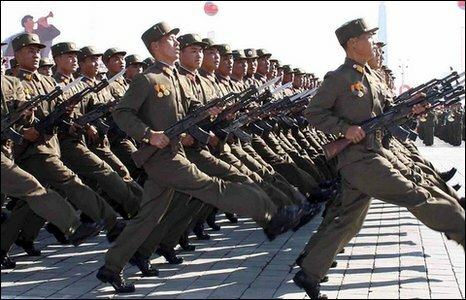 But then, with its personality cults, dictators and marching Young Pioneers, North Korea is so 20th Century. A confused old woman pushing a shopping trolley along the road, a factory worker wearing an old jacket at work, and random street vendors were, all hastily removed from in front of the camera, lest they tarnish the sanitised version of their country that officials wanted us to film. My cameraman almost wept when a group of children playing spontaneously by the side of the road were abruptly shoved aside. "We want to see ordinary people," we begged, day after day. But spontaneity is not allowed in North Korea. That evening we were taken to the theatre to watch a ballet devoted to the triumphant building of a hydroelectric dam. The next morning, we were removed to the safety of Pyongyang's model kindergarten. As I approached each room in the vast, palatial building, children rushed out and grabbed my hand to take me to watch another carefully rehearsed performance. Little girls smiling widely and dancing in perfect formation, little boys in smart red suits and painted faces singing praises to the country's Great Leader. It started off faintly charming. But with mask-like faces and rigid grins, even children become rather sinister. 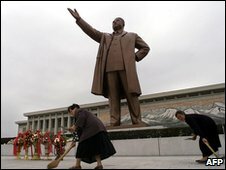 More children are employed to sweep the steps leading up to the 60ft bronze statue of the Great Leader, which dominates Pyongyang. Kim Il-sung died 16 years ago but he's still the country's president. "He's immortal," a 24-year-old-guide explained. "We don't believe he passed away." When I tried to bring the conversation back to reality, to talk about the modern world, she revealed that she had not even heard of Nelson Mandela. This lack of connection with the modern world is disconcerting, especially on the practical level. I had sent a "wish list" to Pyongyang via the North Korean embassy in London of the things I wanted to see and do while in the country. I thought it might be polite to ask to film the country's football team which has, for the first time since 1966, qualified to play in the World Cup. I was given the impression before I left that this, along with my other requests, had been agreed. At my first meeting with my minders in Pyongyang, they put me straight. Not only was the football team out of bounds, but, they claimed, there was not a single football match taking place in the entire county during my nine-day stay. Football is clearly a state secret. One morning we saw another couple sitting at breakfast, also wearing press arm bands. They looked utterly defeated. It turned out that they were Brazilian football correspondents. They, too, had asked to come to the country to watch the football team and had flown from Rio to London to Pyongyang via Beijing to do so. "Going to a match today?" we'd ask cruelly every morning. "No, we're going to the kindergarten," they replied forlornly one day. "No, we're going to the ballet," the next. Despite the craziness, at least I have been able to make something of my stage-managed trip to North Korea - if only to illustrate, by what they allowed me to film - that the Democratic People's Republic of Korea is truly the most bizarre country in the world. But one can only weep at the thought of the Brazilian football correspondents at the ballet.